For other uses, see Palazzo (disambiguation). The Palazzo /pəˈlɑːtsoʊ/ is a luxury hotel and casino resort located on the Las Vegas Strip in Paradise, Nevada. It is the tallest completed building in Nevada. Designed by the Dallas based HKS, Inc., the hotel offers luxury in an Italian Renaissance ambiance. The hotel and casino are part of a larger complex (operated as one hotel) comprising the adjoining Venetian Resort and Casino and the Sands Convention Center, all of which are owned and operated by the Las Vegas Sands Corporation. This all-suite hotel offers the largest standard accommodations on the Las Vegas Strip at 720 square feet (67 m2) per guest room. The hotel complex is the second largest hotel in the world. In its first year of eligibility, The Palazzo was awarded the AAA Five Diamond Award for 2009, and has been awarded the honor every year since. After 2014, The Venetian and The Palazzo no longer receive AAA Diamond awards, as the management has refused further AAA inspections. The Tam O'Shanter motel was built and opened in 1959, on 1.5 acres (0.61 ha) of the land. The motel was owned by Bernie Zeldin, and was named after Illinois' Tam O'Shanter Golf Course, where Zeldin frequently played. The motel had 100 rooms, and featured a distinctive neon sign resembling a tam o' shanter cap. 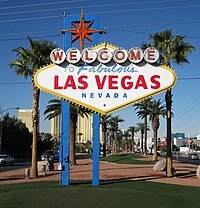 The sign was later donated to the city's Neon Museum. The Spanish Trail Motel went out of business around 1960. In 1962, it reopened as the Imperial 400 Motel. Zeldin declined numerous offers to purchase the Tam O'Shanter. Billionare Howard Hughes attempted to purchase the Tam O'Shanter at some point, initially offering $3 million. However, Hughes was late in delivering the money, and Zeldin subsequently raised the price to $6 million. When Hughes was late again in delivering the money, Zeldin called off negotiations. The Carousel Motel became the Sand Dunes Motel in 1973, and was demolished in 1998. In 1990, the Imperial 400 became a Days Inn. In 1996, it became the Vagabond Inn. Before his death in June 1997, Zeldin finalized a $12.5 million deal to sell the Tam O'Shanter to Sheldon Adelson's Las Vegas Sands, which later opened the adjacent Venetian resort in 1999. Adelson was a friend of Zeldin. Venetian officials purchased 11.4 acres (4.6 ha) of land, including the Tam O'Shanter, in October 1998. Bernie Zeldin's daughter, Leah Zeldin, operated the Tam O'Shanter until its closure. In December 2003, the Zeldin family was informed of the Venetian's plans to demolish the motel for a future resort. While there were no specific plans for the new resort's theme or construction date, company officials wanted the motel demolished so the land could be prepared for the future project, known as The Venetian Phase II, which would consist of a $1 billion resort with 3,000 rooms. Foundation work on the $1.6 billion Palazzo began in September 2004, without a groundbreaking ceremony. As of February 27, 2006, the project had been under construction for over a year. Most of that time was spent digging the 4-story-deep hole to put in the underground parking structure. Then the building itself began to gradually rise upwards. The steel fabrication and erection was supplied by Schuff Steel Company. By November 2006, the hotel tower had reached the 35th floor. Construction of the ground floors, including the parking garage and shopping center, were well under way. As of March 2007, the hotel tower's elevator core was complete, and the rooms area was rising to the top. The façade and windows were being installed on the lower floors. As of August 2007, the lettering on the side of the tower was finished and topped out. As of December 20, 2007, the Palazzo was scheduled to open at least 1,000 rooms by December 28 in preparation for the Las Vegas New Year's celebration, America's Party. The casino and other areas of the Palazzo opened at 7pm on Sunday, December 30, 2007, after a delay of several days due to the Clark County permitting process. Upon its completion, The Palazzo ‒ its total floor area covering 6,948,980 square feet (645,581 m2) ‒ displaced the Pentagon as the largest building in the United States in terms of floor space by a margin of about 383,000 square feet (35,600 m2). The structural engineering was done by Walter P Moore Engineers and Consultants. Parts of the resort were opened to the general public on December 30, 2007. The official grand opening took place on January 17, 2008. In November 2006, Las Vegas Sands sought approval from the Clark County Commission to construct a 632-foot condominium tower on a portion of the Palazzo land. Construction of the $465 million tower began in early 2007, with pre-sales of the condominium units expected to begin by September. The tower was built atop a 90,000 sq ft (8,400 m2) retail building that was part of the Palazzo project. The retail building and the condominium tower were constructed on less than an acre of land which had previously been occupied by the Rosewood Grille restaurant. In September 2008, Las Vegas Sands and Starwood Hotels & Resorts Worldwide announced a partnership to open the tower as "The St. Regis Residences at the Venetian Palazzo, Las Vegas", named after Starwood's St. Regis brand. The tower would include 398 units, and was expected to cost $600 million at that time. Under the deal, Starwood would manage the tower upon its opening, which was scheduled for March 2010. In November 2008, Las Vegas Sands indefinitely suspended construction of the St. Regis because of the Great Recession. An additional 18 months of construction was needed to finish the project, which was to stand 50 stories high upon completion. In November 2009, Las Vegas Sands stated that work would remain suspended until the economy improved. In June 2011, Las Vegas Sands covered the unfinished building with a $1 million wrap made of giant cloth sheets that were printed to resemble a finished building. A company spokesman said that until a decision was made regarding the project, "We thought it was appropriate to improve it aesthetically in the meantime. We wanted it to look a little more like it belongs between a pair of five-diamond resorts like The Venetian and Palazzo." Michael Leven, president of Las Vegas Sands, had a view of the unfinished tower from his third-floor office, and later stated: "I couldn't stand looking at that steel. One day I was out at the pool and I realized our guests were looking up and staring at the steel. We put the cover on it and it's held up well. You sometimes forget it is there if you walk by." The $1.8 billion resort features a lobby where guests from the street arrive beneath a 60-foot (18 m) glass dome with a two-story fountain. Those approaching from The Venetian make the transition through a towering octagonal structure and garden, itself topped by a glass-and-iron dome. Visitors to The Palazzo using the underground parking structure can take elevators or escalators from the underground garage and arrive in the center of the property's casino. The Palazzo is reported to be the eleventh largest building in the world in terms of available floor space and is also currently the second-largest building in the Western Hemisphere. Features upscale boutique stores from the likes of Ralph Lauren, Jimmy Choo, Fendi, Cole Haan, Piaget, Diane von Furstenberg, Chloè, Bottega Veneta, Bulgari, Michael Kors, Burberry, Christian Louboutin, Catherine Malandrino, Anya Hindmarch, Charriol, and others. It also features an 85,000-square-foot (7,900 m2) Barneys New York. The under construction Palazzo was the setting for an early scene of Ocean's Thirteen (2007). 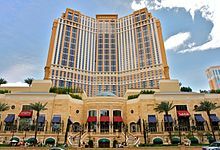 The hotel is the main location in the final novel in the Vegas book series Palazzo, wherein American currency is attempted to be transferred to Milan, Italy, for a drug deal. The construction of Palazzo was featured on the Science Channel's Build It Bigger. The Palazzo was the shooting location featured in Season 5, Episode 18 of MTV's The Hills as well as a setting for the dramatic season three finale. The U.S. game show Wheel of Fortune taped four weeks of shows at the Palazzo in July 2009. Two weeks of shows aired in September 2009, and the other two aired in February 2010. Also, the show taped six weeks of shows in July 2013 starting with the September 2013 Season 31 premiere. ^ a b Stutz, Howard (January 1, 2008). "The Strip: Officials open Palazzo casino". Las Vegas Review-Journal. Retrieved January 10, 2008. ^ "Diamond Ratings - AAA NewsRoom". Retrieved August 25, 2016. ^ "The Palazzo Las Vegas - Las Vegas NV - AAA.com". Retrieved August 25, 2016. ^ "Ottilia Villa Motel". VintageVegas. Retrieved November 23, 2016. ^ a b c d e f g "Palazzo history". VintageVegas. Retrieved November 23, 2016. ^ "Spanish Trail Motel". VintageVegas. Retrieved November 23, 2016. ^ a b c d e f g h Smith, Rod; Huey, Erik C. (January 7, 2004). "Closure nears for Tam O'Shanter". Las Vegas Review-Journal. Archived from the original on December 5, 2004. ^ a b c d e Schorr, Melissa (August 15, 1998). "Hold 'em or Fold 'em?". Las Vegas Sun. Retrieved November 23, 2016. ^ Padgett, Sonya (March 6, 2001). "The Strip: Limited Lodging". Las Vegas Review-Journal. Archived from the original on February 7, 2002. ^ Morrison, Jane Ann (May 17, 2008). "Check out old Vegas in all its nostalgic glory — at a cut-rate price today". Las Vegas Review-Journal. ^ Cling, Carol (October 26, 2012). "Neon Museum preserving Las Vegas history by giving old signs new life". Las Vegas Review-Journal. Retrieved November 23, 2016. ^ a b c d "Fare Thee Well O-Tam O'Shanter". KLAS-TV. January 12, 2004. Archived from the original on July 6, 2016. ^ "Bernie Zeldin (1912–1997)". Find a Grave. August 29, 2007. Retrieved November 23, 2016. ^ a b c Smith, Rod (February 7, 2004). "Asbestos-removal challenges may hamper hotel projects". Las Vegas Review-Journal. Archived from the original on October 30, 2004. ^ Benston, Liz (January 7, 2004). "Motel coming down to make way for Venetian development". Las Vegas Sun. Retrieved November 23, 2016. ^ a b Smith, Rod (September 14, 2004). "The Strip: A peek at the Palazzo". Las Vegas Review-Journal. Archived from the original on October 11, 2004. ^ Padgett, Sonya (February 27, 2002). "Spice of Life: Street of Many Flavors". Las Vegas Review-Journal. Archived from the original on March 11, 2003. ^ Illia, Tony (Nov–Dec 2007). "Palazzo Resort Packs a Powerful Punch". Construction Magazine. Retrieved February 17, 2009. ^ a b c Levitan, Corey (March 24, 2010). "High hopes turn to broken dreams for several local projects". Las Vegas Review-Journal. Retrieved February 21, 2018. ^ a b c "Pact reached on St. Regis Residences". Las Vegas Sun. September 4, 2008. Retrieved February 21, 2018. ^ Stutz, Howard (November 7, 2006). "Sands to join condo market". Las Vegas Review-Journal. Retrieved February 21, 2018 – via NewsLibrary. (Subscription required (help)). ^ a b "Sands raises condo ante". Las Vegas Review-Journal. April 18, 2007. Retrieved February 21, 2018. ^ "The St. Regis Residences at the Venetian Palazzo". Emporis. Retrieved February 21, 2018. ^ Benston, Liz (March 14, 2008). "New motto for Las Vegas Sands: Let no space go to waste". Las Vegas Sun. Retrieved February 21, 2018. ^ Stutz, Howard (September 4, 2008). "Starwood Hotels and Resorts to develop Sands high-rise project". Las Vegas Review-Journal. Retrieved February 21, 2018. ^ Stutz, Howard (September 5, 2008). "High-rise goes high-end with Regis brand". Las Vegas Review-Journal. Retrieved February 21, 2018. ^ Benston, Liz (November 10, 2008). "Las Vegas Sands shelves projects: Company seeks $2 billion to stay afloat". Las Vegas Sun. Retrieved February 21, 2018. ^ Stutz, Howard (November 11, 2008). "Sands suspends construction in LV, Macau". Las Vegas Review-Journal. Retrieved February 21, 2018. ^ a b O'Reiley, Tim (June 10, 2011). "That's a wrap: Las Vegas Sands finishes condos with giant cloths". Las Vegas Review-Journal. Retrieved February 21, 2018. ^ Green, Steve (November 9, 2009). "Las Vegas Sands expects $3.35B from Asian IPO". Las Vegas Sun. Retrieved February 21, 2018. ^ a b c Stutz, Howard (April 2, 2014). "'Cover-up' is over: Las Vegas Sands moving past 'million-dollar' tarp". Las Vegas Review-Journal. Retrieved February 21, 2018. ^ Friess, Steve (August 4, 2008). "Las Vegas bets on environmentalism". USA Today. ^ "Las Vegas restaurant agrees to drop use of Lamborghini trademarks". February 23, 2012. Retrieved August 25, 2016. ^ "Biggest Casino" – via www.imdb.com. Wikimedia Commons has media related to The Palazzo (Las Vegas). This page was last edited on 16 February 2019, at 22:57 (UTC).